A crow's nest is made of materials like twigs, electrical wires, metal strips, plastic pieces, and other small items. ↑ Andrea K Townsend and Christopher M Barker (2014). Plastic and the Nest Entanglement of Urban and Agricultural Crows Heiss, R., Clark, A. and McGowan, K. (2009). 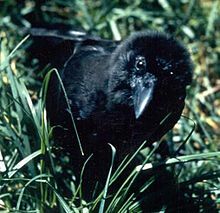 ↑ Growth and nutritional state of American crow nestlings vary between urban and rural habitats. Ecological Applications, 19(4), 829-839.